I have gathered these 28 quotes to bring greater understanding to the mandala as a tool for healing, balance and transformation. As you read these quotes, you may explore your own life, or your own experience in the moment, for they are the mandala in an interconnected dynamism that unfolds and reveals ever new forms of your potential. Mandala simply means “center and surroundings”. That is what we see in a mandala – a circle that contains a square…The practice of a mandala is simply to place ourselves in the middle of it and learn to relate with the social structure and atmosphere around us as a sacred environment. A mandala is...an integrated structure organized around a unifying center. The flower’s perfume has no form, but it pervades space. Likewise, through a spiral of mandalas formless reality is known. We should learn to see everyday life as mandala - the luminous fringes of experience which radiate spontaneously from the empty nature of our being. The aspects of our mandala are the day-to-day objects of our life experience moving in the dance or play of the universe. In the state of consciousness natural to the field within the mandala - that of Self-realization, or non-duality - such opposites as inner and outer, or subjective and objective, male or female, matter and spirit, are all grasped as connected, married, ultimately unified. When there is no more separation between “this” and “that” it is called the still-point of Tao, at the still point in the center of the circle, one sees the infinite in all things. Your consciousness, your soul, is the center of this mandala, and the rest of the universe is the environment surrounding it. The totality of the mandala is unfolding according to an intelligent pattern; it is a dynamic mandala. Mandalas are often described as cosmoplans in both the external sense, as diagrams of a cosmos; and in the internal sense, as guides to the psycho-physical practices of an adherent. Everything that shows up in your mandala is a vehicle for your awakening. From this point of view awakening is right at your fingertips continually. That said...the word Mandala is derived from the root Manda, which means essence, energy or spirit, and by adding the suffix la to any Sanskrit word, it becomes the container or vessel for it; thus revealing the Mandala as a container for essence, energy or spirit. In the infinite mandala of space, all phenomena are easily accommodated. They have easy space and there is still space. The center of the Mandala is the Now-moment, where, through the quality of attention, we constantly create ourselves anew. We experience the seamless, unimpeded flow of everything that arises and dissolves within the reality-sphere that is the mandala of our own existence. Nothing is out of place; everything gives unique expression to an infinite network of conditions that are implicated in every manifestation from the most miniscule to the most cosmic, from the most insignificant to the most magnificent. 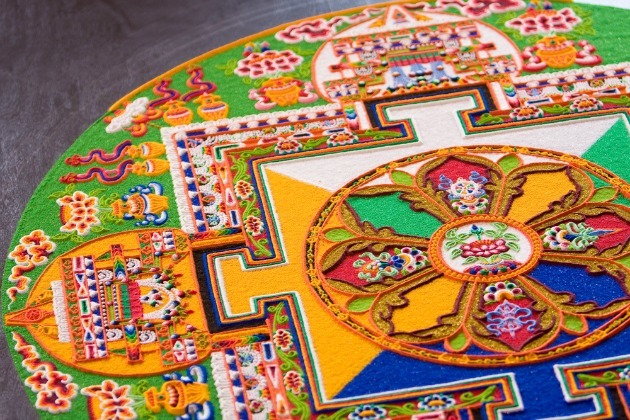 We have the symbolism of the mandala and we have the basic principle of the mandala. The mandala is a microcosm within itself, a tiny representation of the universe where myriads points unite and oppose each other to achieve a harmony of peaceful unity. The architecture of the mandala represents both the nature of reality and the order of an awakened mind. Our lives can only be seen as a mandala if we include everything, all positive qualities as well as all that we would like to ignore, reject, or distance ourselves from. The pattern found within the mandala can help describe the nature of our being as well as the nature of our cosmos. The study of mandalas often includes contemplating the core of reality, what is at the ‘true center’ of the world in which we live. The mandala principle expresses the experience of seeing the relatedness of all phenomena. When our minds are conditioned to live close to the perimeter of the Mandala – away from the Now center – we have a false sense of self and a mistaken view of others that blinds us to their essence and us to our own.